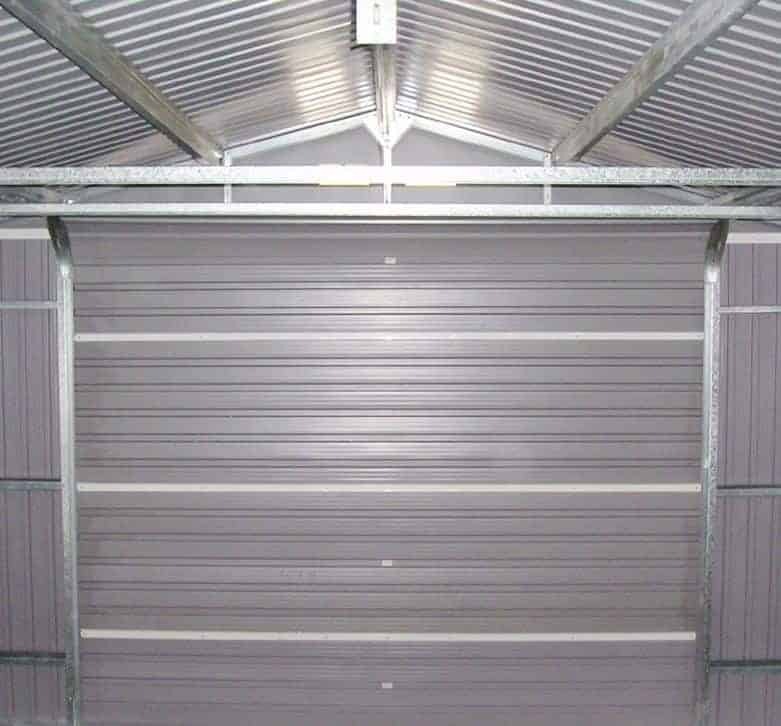 If you need a garage that is spacious and durable and yet doesn’t require any treatment or maintenance once it’s installed then a metal garage is the ideal choice. 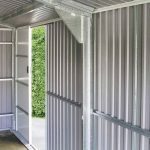 If, however, the thought of a metallic looking building on your property puts you off, then this could change your mind. 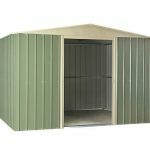 It has an attractive green and white colour scheme and so will complement your garden rather than standing out. 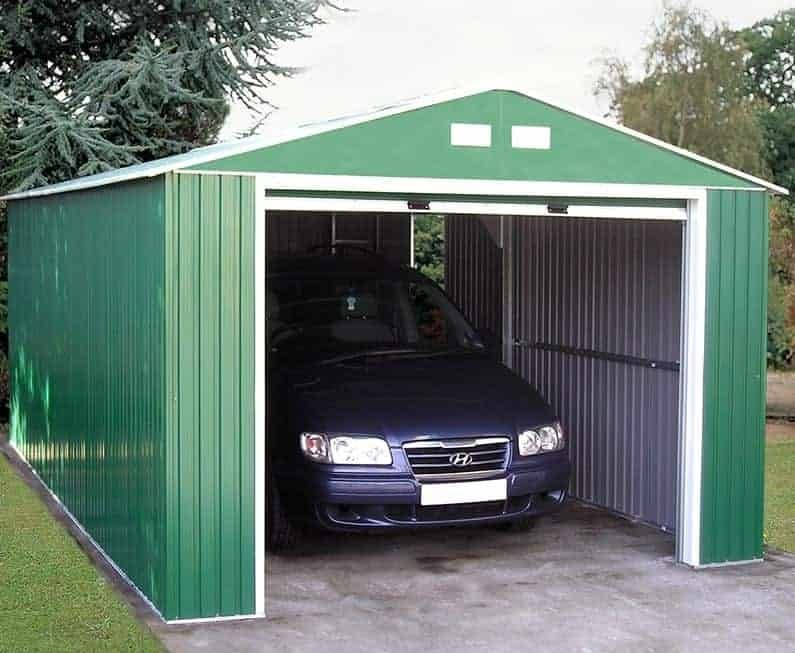 Perhaps the main advantage of this garage is its size, and especially its very long depth. This means that once a car is safely parked inside, there’s still lots of room available that you can then use for other storage purposes. Added convenience is provided by a side personnel door, in addition to the large up and over door at the front, which means that you can gain easy access to this space even when a vehicle is parked at the front. It was good to see that the cladding used was thick on the walls and on the roof, and that it had been through a hot dipped galvanisation process. 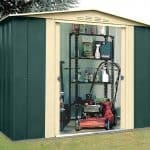 This means that the customer won’t have to worry about their garage being affected by rot or rust, rodent attacks or warping. 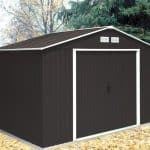 This is a large dimensioned metal garage, but that certainly doesn’t mean that it’s ugly or even obtrusive. We like the dark green and white colour scheme applied to the metal cladding, and this was just one of the features that elevated this building above the majority of metal sheds that we review. We were struck at first sight by just how deep this building is, with its overall depth of 11.45m standing out compared to its width of 3.72m. It means that you’ll need only be able to fit a car inside with ease, you’ll also have lots of extra room available to use as you wish. The depth wasn’t the only impressive dimension, as the large apex roof also makes it very tall. The ridge height is 2.59m and the eaves height is 2.10m. With such a large building it’s essential that the cladding and frame is tough enough to give it the support and stability it needs. That’s why we were glad to see that not only had a heavy duty frame been used, but also that the cladding used had been hot dipped galvanised, a process whereby it’s bonded with copper. This makes the finished product reassuringly strong, and it feels stable once fully assembled. There’s no floor of course, but then we wouldn’t have expected there to be on a garage of this size. We would have expected an anchor kit to be included, however, but unfortunately it’s been left to the customer to purchase one as an optional extra. We were pleased to see that a 10 year warranty has been provided by the manufacturer against the appearance of perforations caused by rust. In all likelihood the customer will never have to call on this, but it’s good to know it’s there. Having said that, with such good quality cladding used, and then topped with an extra protective layer of paint, we feel that the warranty provided could have been even longer. 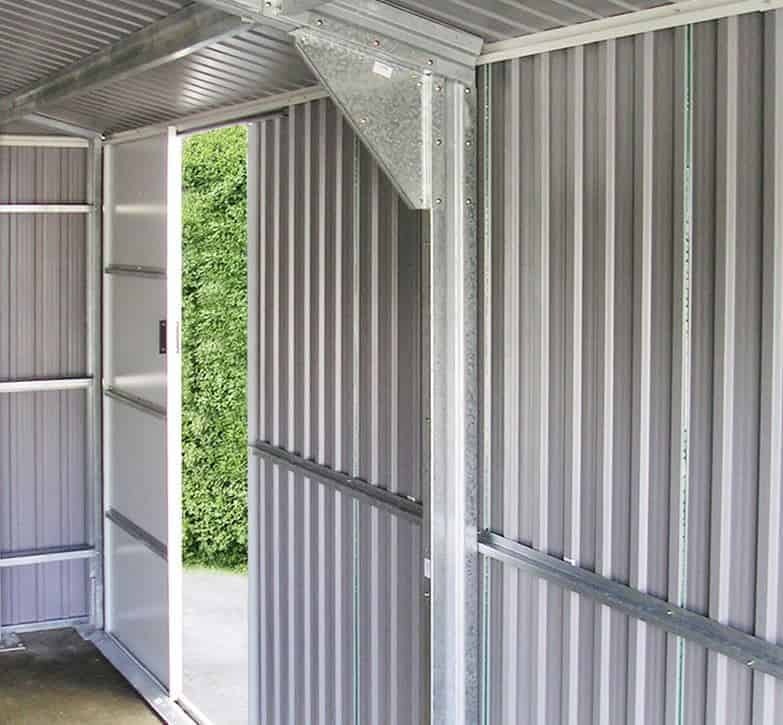 One advantage that all metal garages have over their timber counterparts is that they come with no treatment requirements, so this really is maintenance and worry free. 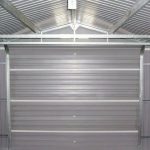 The door at the front of this garage is just what we expected, as it operates in a typical roll up and over fashion as found on many garages and is also very large. It has a width of 2.52m and a height of 2.05m, which is as generous as any of the garage doors we see and means that you won’t need to be concerned about catching the sides of your car. What we liked most of all, however, was the inclusion of a side access door towards the rear of the garage. This means you have easy access to the wealth of space available once the car is parked up, and with the inclusion of a light source this could even be used as a workshop. The need for a light source is because there are no windows, but there is plenty of ventilation provided thanks to the vented gables. We feel that the window free design of this building can be a useful security feature, as it means that opportune thieves can’t see what’s inside. This makes it much more likely that they’ll pass your garage by in search of targets that are easier to assess. On a negative note, however, we were disappointed to see that no secure locking system is included, even though both doors are padlockable. The first extra that we recommend, therefore, is a set of two padlocks and ideally an alarm as well, but unfortunately they aren’t offered for sale along with the garage. This means that the customer will have to source them separately. One optional extra that can be picked up at the point of sale is a set of Hilti screws costing £21. These can be used as an anchor kit to screw the garage down to a pre-existing area of level concrete, but again we would have liked these to be provided with the standard package. It was good to see that hot dipped galvanised steel cladding had been used, and the well executed paintwork was yet another sign of quality. Whilst the warranty period lasts for ten years, we wouldn’t be surprised to find that this garage lasts much longer without any signs of rust perforations appearing. 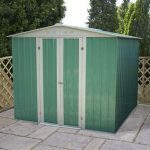 This is one of the deepest, and indeed tallest, garages that we’ve reviewed, so you’ll have lots of extra storage space that can be utilised. The manufacturer’s estimated assembly time is eight to ten hours, but due to its size we would recommend setting aside two days for you and friend to complete the installation in. 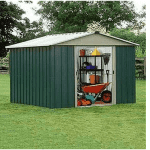 The price of over three thousand pounds may prevent some people from purchasing this garage, but it is well constructed and offers a large and versatile storage facility. Final Thoughts: We liked both the look of this garage and its value adding features. If your budget will stretch to this price of just over three thousand pounds, then it’s well worth considering. A little extra expense will be incurred buying the anchor kit, locks, alarm, and interior lighting, but this needn’t add up to a lot of money. On the other hand, significant savings can be made over time as there’s no need to paint the substrate or treat it with a preservative. 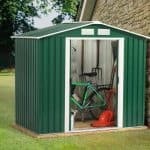 This is a garage that you can assemble and then worry about no more, and we also feel that with the right lighting added it would make a very useful space to work in for either a business or a hobby.